At this time, we are unable to accept any carving work. Sorry. 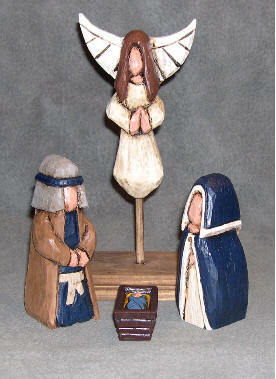 After numerous requests, Tom finally agreed to carve a nativity set for one of his collectors. He decided upon the faceless angel style, and created simple lines to make a primitive folk art set. Mary is painted in midnight Blue with white trim, an antique white undergarment and soft brown sandals which peek from beneath her cloak as she kneels. Joseph's undergarment compliments Mary's, and he has a gray head cloth which offsets his light brown robes. Baby Jesus is wrapped in a liberty blue blanket and lays on kings gold straw. 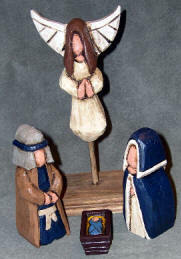 Above the trio hovers an angel in prayer. Her base is not attached, so if you decide to place them in a creche, the angel can float above that on a 1/4" dowel. These are not a stock item. Tom hand carves each set to order. For that reason, it could take eight to ten weeks - depending upon his carving schedule. The pieces were designed as a 6" tall set. Joseph & Mary are kneeling, so naturally shorter. No patterns are used, so your set could be different - but Tom will keep this style and coloring, unless otherwise requested. This is a basic set - other pieces will be available as time goes - but only to those who have purchased the basic set. If you have any questions, please e-mail us using the link at the bottom of this page. We are currently not accepting orders for the Nativity Sets. Sorry. Please note all Nativity carvings are one of a kind. Tom will carve in the style pictured - however due to the hand carved, painted and antiquing techniques - your set will be different. By ordering, you agree that you understand the nature of hand carved art. Thanks for understanding!